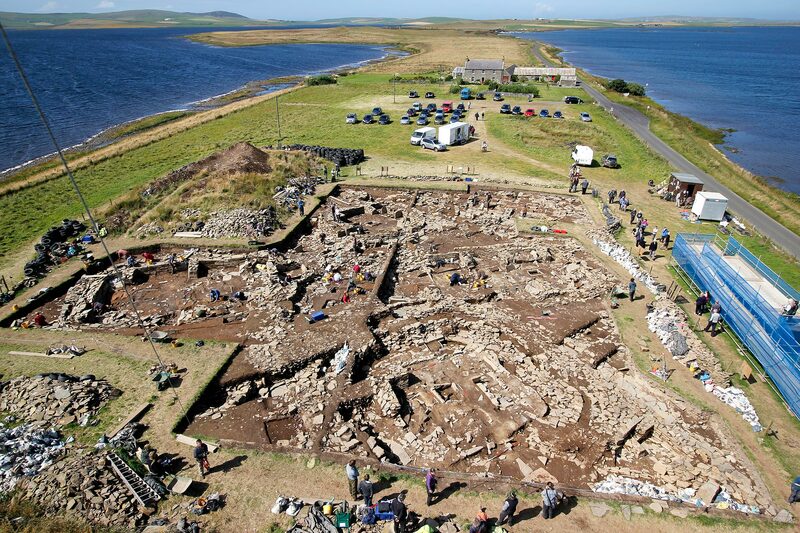 Well, that is the end of the dig at the Ness of Brodgar for another 10.5 months. With good luck, and the generosity of funders, we will all be back in July next year. The time has slipped by amazingly quickly. It hardly seems a week, far less six of them, that the black plastic was slipped back to reveal the Ness in all its glory, and the beginning of another season of digging. Still some amazing finds are still being uncovered as we prepare for the covering of the site. 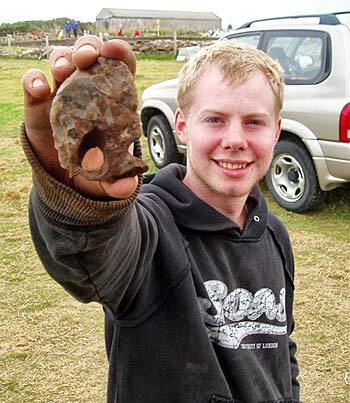 Sandy found one of the largest pieces of flint from the site – an obvious piece of chalk flint that is alien to Orkney. 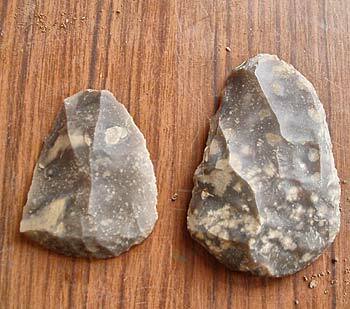 Close by, in Structure Eleven, two, almost identical, flint scrapers also turned up – so similar, in fact, it makes you wonder if they were produced by the same craftsman. We have been blessed by many things over these six weeks; by good weather, great archaeology, fantastic finds but, above all, by the people who have worked here, the people who have helped us and the people who have flocked here in huge numbers to visit us (some 5,700 plus, at the last count). In a sense, this is just as it should be. The study of archaeology is, undoubtedly, the examination of the material remains of the people of the past. But the people themselves are the real object of the study. Why did they do something? How? When? And where? All of these questions are posed in abundance at the Ness, and every time one is answered, another question springs up in its place. Site director Nick had a long list of questions to ask of the Ness this summer. He says that everything he wanted to achieve in this season of digging has been achieved, and more. Yet, as ever with this astonishing site, further challenges have emerged for next year. The team of professional archaeologists, young and not-so-young volunteers, and students from all corners of the globe have bonded together perfectly. Each has learned from the other and one of the saddest things, at the end of the season, is to see the breaking up of a team which has worked so well. In contrast, one of the really pleasant tasks is to thank those who have given so unstintingly to the work here. We must begin with the landowners, Arnie and Ola Tait and Carol Hoey, who have so generously allowed us to invade, and excavate, their property year by year. Without their help, support and encouragement the Ness would still be an enigmatic mound in the landscape and a tantalizing series of squiggles on a geophysics map. We also owe a huge vote of thanks to Professor Scott Pike, of Willamette University, in Oregon, and his hard-working students. 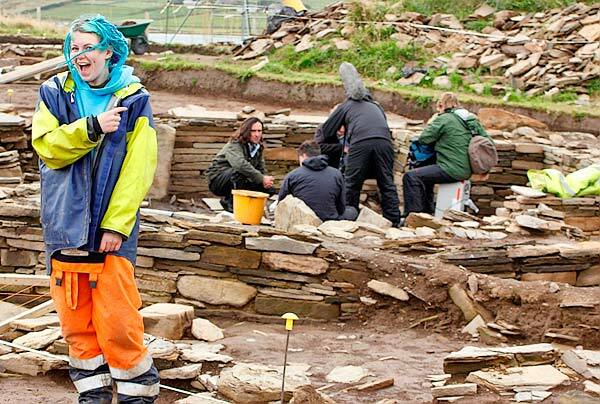 The relationship established between Willamette and the archaeology department at Orkney College, UHI, has grown and deepened this year and will continue in the years to come, as more American students use the Ness as a training dig, under Scott’s supervision. We look forward immensely to seeing them again next year. We warmly thank Sigurd Towrie, who has hosted us, yet again, on his website, Orkneyjar – shoe-horning our blogging efforts and photographs into the available space with skill and endless patience, and writing articles about the Ness in The Orcadian with his customary understanding of the intricacies and complexity of archaeology. 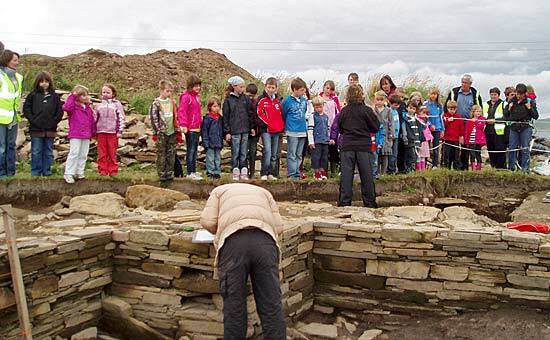 Thanks to the Historic Scotland Rangers, Sandra, Elaine and Keith, who have contributed so much in conducting tours with their usual leather-lunged charm, and for adding so much to the enjoyment of the young folk who have joined us on planned programmes, including the youngsters of Stenness Primary School, who started their new school term with a tour of the site today (and were hugely impressed to see Neil Oliver still filming on site). Helen Woodsford Dean is also thanked for her contribution to the work with the youngsters. Also special thanks to OAS and the numerous volunteers who contributed so much on site and in manning the OAS site shop. The finds team, so ably led by Anne, was also notable in their extremely hard work, in particular volunteer help from Martha, Babette and Joyce. And we thank those who have funded or supported the excavation, all of whom will no doubt be hearing from Nick during the next few months. They include, in no particular order, Orkney Islands Council for their continuing support; The British Academy, for the Smart Fauna project; Historic Scotland; the LEADER Fund; the Russell Trust; the Royal Archaeological Institute; Orkney Archaeology Society; the Robert Kiln Trust; Orkney College; University of the Highlands and Islands; the BBC; numerous generous individuals from around the world and, last but not least, all you who have poured money into our white collecting buckets. Thanks to all, and we’ll see you next year.